Cheekha Dar, (Kurdish: Çîxî Derê / چیخی دەرێ‎) which means Black Tent, is the local Kurdish name for the mountain currently thought to be the highest in Iraq. It is claimed to be 3,611 metres high in the CIA World Factbook. It is 6 kilometres north of the village of Gundah Zhur and is on the border with Iran. It was climbed in November 2004 by English explorer Ginge Fullen, who recorded a GPS reading of 3,628 meters at the coordinates in the adjacent table. The location is consistent with SRTM and Russian topographic mapping, although these sources are more consistent with the CIA height. The first reported winter ascent was by Jonathan Beswick and Matthew DuPuy on March 18, 2011. The expedition GPS confirmed 3,611 m. There is a danger of land mines in the area on approach between Hamilton Road and the village of Gundah Zhur. Some fields are marked by red, triangular signs with skull and crossbones. It is possible to find Kurdish military escorts through this area in the town of Choman. A nearby peak called Halgurd, at 36°44′N 44°52′E﻿ / ﻿36.733°N 44.867°E﻿ / 36.733; 44.867, is thought to be 3,607 metres high, and had previously been thought to be Iraq's highest mountain. ^ a b c "Cheekha Dar, Iraq/Iran". Peakbagger.com. Retrieved 2014-05-26. 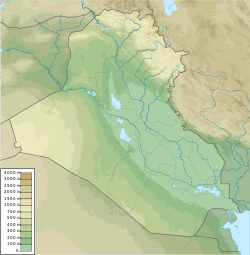 This Kurdistan geographical location article is a stub. You can help Wikipedia by expanding it. This page was last edited on 14 January 2019, at 05:46 (UTC).